A High Calling – Managing Our Resources (w/3 part podcast). This past fall was a successful and fun filled hunting season being able to build new friendships and developing my skills as a hunter and trapper in Michigan’s Great Upper Peninsula. I’m an Active Duty Coast Guardsmen, and last fall was my first time back in Michigan for the past three years. Stationed in Sault Ste. Marie I could not wait to get back into Beaver Trapping. Going through my traps that were left behind at my parents’ house for the past few years I decided to part with a few, and add some more #330’s to my collection. That is when I met Gary Morgan with East Lake Outfitters. It was a simple craigslist sale that would form a lasting friendship. We met over the sale of some old traps, I showed an interest in Beaver trapping and Gary had offered to show me around some Beaver ponds in the area. Opening Weekend of the 2014-2015 trapping season I showed up at East Lake Outtfitters before sunrise to get some traps wet. With Gary’s first class guiding skills he was able to show me several different beaver ponds between Rudyard and Trout Lake. We chose three ponds to pursue that season all very active and large in area. With limited time, having a job in the Soo, we would only set four traps at a time, allowing easier management of our traps. The ponds we were trapping were enormous making it challenging to find the Beavers most active runs with only a few traps. We studied and scouted each pond for some time before choosing a set of runs. Next was setting up the traps, my 2nd favorite part to trapping. I carry my 330’s on a stick that I will use to set across the run since I only go into the woods with two traps at a time. One well placed trap can yield results every day until the den is trapped out if that’s how you want to do it. I personally like to trap two beaver from each den, typically the two adults, leaving behind the kits who will mature next year and move out to find their own mate. Trapping this way allows for ideal conservation, which I encourage every hunter and trapper to follow allowing the preservation of resources for our kids and grandchildren. When I first started trapping at sixteen I had no idea what I was doing. I loved hunting and fishing, everything outdoors, it seemed trapping was the only thing I had yet to try my luck at. My first experience was trapping a beaver pond in the middle of a swamp near my Family cabin located between Trout Lake and Rexton. We had stumbled upon it earlier in the year four wheeling and scouting for rifle season. I remember looking at it in complete astonishment. ‘Til this day I have yet to see runs as heavy as this pond. I set two traps opening day and returned in the morning to find both my traps missing, I couldn’t believe it. Being new to trapping I never secured my traps, this was my first lesson learned. I started dragging the runs that looked more like a moat guarding a mid-evil castle. 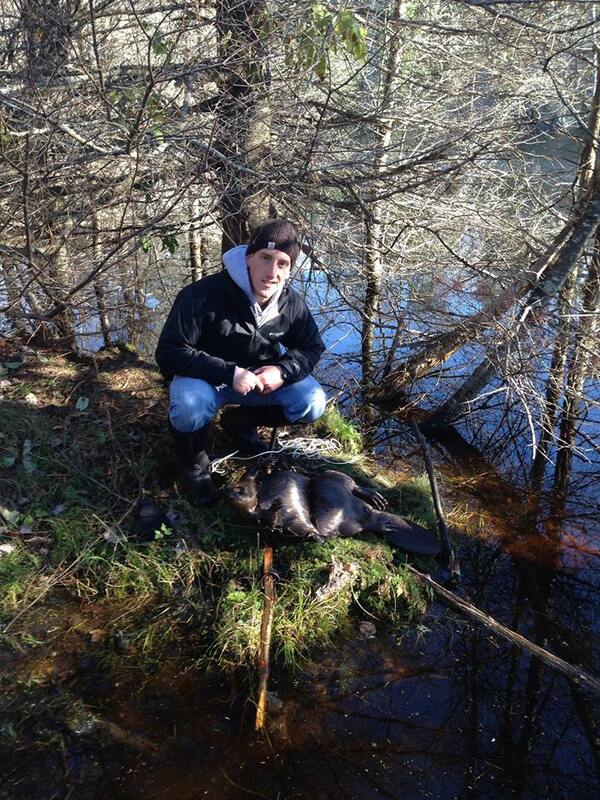 It wasn’t long before I pulled two adult Beaver out of the water weighing 46 and 64 pounds. I would describe finding animals in your traps like Christmas morning; I still get that feeling today every time I check mine. That happens to be my favorite part of trapping. I reset my traps that day not realizing the importance of conservation and trapped two more the next day, two kits weighing maybe 25 pounds. I had just started trapping and at the time I hadn’t entirely appreciated or understood the importance of conservation. I check that first beaver den every year and since I trapped it out nothing has moved in, leaving it to dry up. There are no laws against trapping kits, but if you leave the kits to mature you are going to have something to trap the next year also allowing for a healthier beaver population. I like to set the traps across the top of the water in the middle of the run. The trap is completely submerged basically free floating on the stick across the run. I put sticks on both sides of the trap like posts to block off any openings allowing the beaver to funnel into the trap. I usually place a long log over top of the set as well to encourage the beaver to duck down and submerge itself under water. I also run a piece of 14 gauge wire to a nearby sapling or stump, to secure the trap. There are many different techniques and sets you can use, however I have found this technique the quickest, easiest and most successful. Also, I do not use any scents or lures, in my opinion they are a waste of money, and won’t yield you anymore success. Scouting is one of the most essential components with anything, find the most active runs; fresh chewing’s, mud tossed up from the previous night, as well as drag marks off the bank into the water. The first day our traps were empty at both ponds, the areas we were trapping were so large, one pond had 3 lodges in it. I thought it might take a day a two for the Beaver to use the runs we chose. If nothings hit by day three, I would recommend moving them to a new run. On day two we went two for two trapping one adult beaver at each pond. We reset the traps and after one more day decided to move them to a more active run at the pond with three dens. There we trapped one more adult beaver the next day. We decided to move all four traps to a third pond we had been scouting, again very large in area with lots of recent activity. We started setting up our traps; we had two in the water when a father and son trapping team stumbled upon us looking to set up some traps. It turned out to be a very positive friendly encounter, we all shared the same passion and talked for a while sharing stories and experiences, they had decided right away to let us trap the area since we were there first. It was a great experience as both parties were polite and easily came to an agreement so quickly. That’s what being a sportsman is all about. The father had three sons; all UP natives who were die hard trappers, running a trap line on a much larger scale than we were. We set a trap near a run that had a scent mound on the bank, that beaver dig up to secrete their scent in. The next day that trap had an adult beaver in it. We kept traps there for 3 more days yielding nothing as the pond froze over. The second week of November winter came in fast and hard, we had nearly 3 feet of snow on the ground in the Soo, and the Beaver ponds were frozen over. With rifle season starting up and frozen ponds we decided to pull the traps for the year. 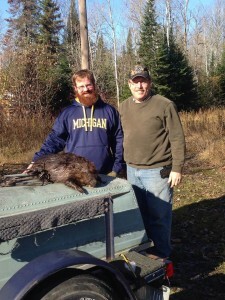 In two weeks with 4 traps and three ponds Gary and I were able to trap four adult beaver ranging from 38-46 pounds. It was a successful first time back to trapping, and with spring here in the UP I plan on getting a few traps wet this weekend with two weeks left in the beaver trapping season, closing here in the UP on April 13th. Trapping has without a doubt made me a much better sportsman and allowed me to mature in the sport of hunting as well. The reward isn’t necessarily the harvest, being presented with the chance to make a harvest is the reward. Living in Michigan’s great outdoors is the true reward. People who hunt, fish and trap are a world class group of people in my opinion, we all share a common bond. Hunting is something that’s engrained in our DNA. There are no drugs in this world that could ever replace the thrill of being in the woods; it’s something that has a purity and sacredness to it you cannot find in another sport or activity.